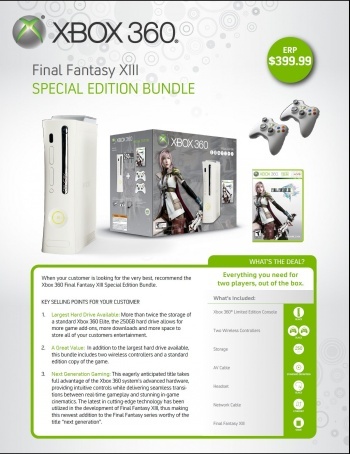 North America Gets Final Fantasy XIII Xbox 360 Bundle? Unsurprisingly, the first-ever "proper" Final Fantasy game on the Xbox family will come with its own 250GB bundle - and perplexingly, will include two controllers. It seems par for the course for the big-name releases to get console bundles these days (and occasionally, not big-name releases), so the news that Final Fantasy XIII will be getting a special Xbox 360 release should come as no surprise to anybody. And, thanks to NeoGAF, now we have potential confirmation of what we probably all should have seen coming when FF13 hits North America in March. It's your fairly standard stuff here, though there's no word on if "Limited Edition" means that the console itself will have special FF13 branding - I suspect not. My only question is, "Why the hell does it come with two controllers?" A game like Halo or Modern Warfare? Sure, you'll want multiple controls for the multiplayer. And the Final Fantasy series isn't known for its multiplayer. In all honesty, this is a pretty uninspired run-of-the-mill bundle, but in case you're really aching to buy FF13 on the 360 (maybe to reflect fondly on the magic age of disc-swapping) and don't have it yet, it's probably going to be a decent deal at $399. Presumably, the PS3 will be getting a bundle of its own. Honestly, I'm just hoping against hope for something that looks as awesome as that special FF13-Edition PS3 Slim. Real men aren't afraid to game in pink (and white).